Colors: Black and Red with silver trim. Heraldry: A Dragon with blood drenched claws. Numbers: 300 Traitor Astartes, thousands of cultists and slaves. Main Base: Battle Barge "Hammer of Fate"
Doctrine: CQC and Hit and Run Tactics. Battle Cry: "The Dragon Comes!" The Sons of The Dragon first appeared in late M41, pillaging and generally wreaking havoc along the western borders of the Imperium. They favored either wealthy or military targets, using hit and run tactics to avoid a confrontation with a force of any actual size. It was later confirmed that they often took prisoners to be made slaves aboard their ships, or be used as cannon fodder. It was later confirmed that the Astartes of this warband were formed from the remnants of the three traitor chapters destroyed during the infamous "Ingus Eternae" Crusade conducted by the loyal Ember Knights, Storm Rulers, and Doom Hounds chapters. 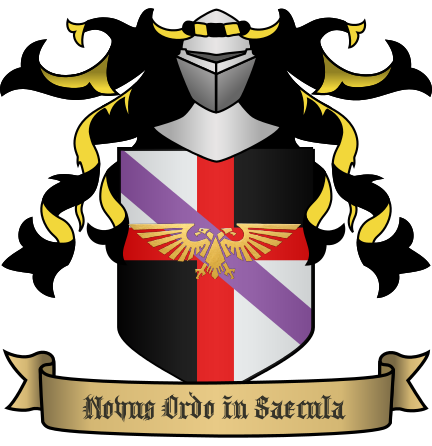 The Leader of the Sons of The Dragon, one Lucanis Dracul, was found to have been at one time a Blood Raven under the name Ultor, with connections to an obscure organization known as the Ordo Relayus, which was later found to be rife with heretics and traitors. There seems to be little mutation among this warband, rather they esqew it in favor of personal honor and strength.